Everybody wants them on their teams. The person who will create the software your company needs, the people who can take your startup or business to the next level. They can produce what you are thinking and make it in a record time. 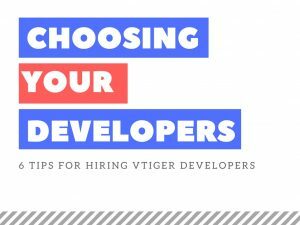 It is often hard to know what to look for in programmers you want to hire if you are not a programmer yourself, especially if you are looking for a specific type like Vtiger Developers. The war for finding the right vtiger development firm is harder than ever. That is why is relevant that you hire the right company the first time. 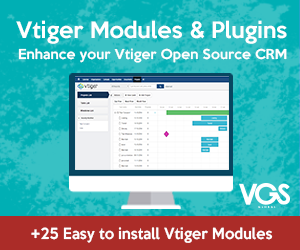 Whether you want to build a new module, a vtiger integration with another system or a new CRM for a particular vertical, is important that you make the right choice. Otherwise, you risk hurting your business and not only that but also time and money seeking a replacement. To get closer to the profile you are looking for and to get much more relevant proposals in our inbox, you should be as accurate as possible in what you are looking for. You must understand and be able to communicate your exact requirements before you send an email to a prospective vtiger development company. Ideally, you will be able to write them down a coherent list of thoughts and requests. If there is an area where you are not exactly sure of what you want, make sure you explain yourself properly to potential development company so they can help you out and get the exact idea. 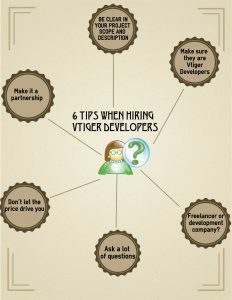 If you search on Google for Vtiger developers, you may find people from all over the world: freelance, site, PHP, developers and so on. Keep an eye out for shops that have proved experience working with Vtiger. Some tips would be: case studies, forums participations (can be a good indication but not enough) or you can also check whether they had published modules Vtiger Marketplace or not. Each company, like VGS, which has published a few modules in Vtiger Marketplace, has to follow strict coding guidelines, that way you make sure they are following the best practices. Keep in mind to ask your developers to follow the same rules and coding best practices. Don´t jeopardize a key business asset with an inexperienced developer. 3. Freelancer or development company? 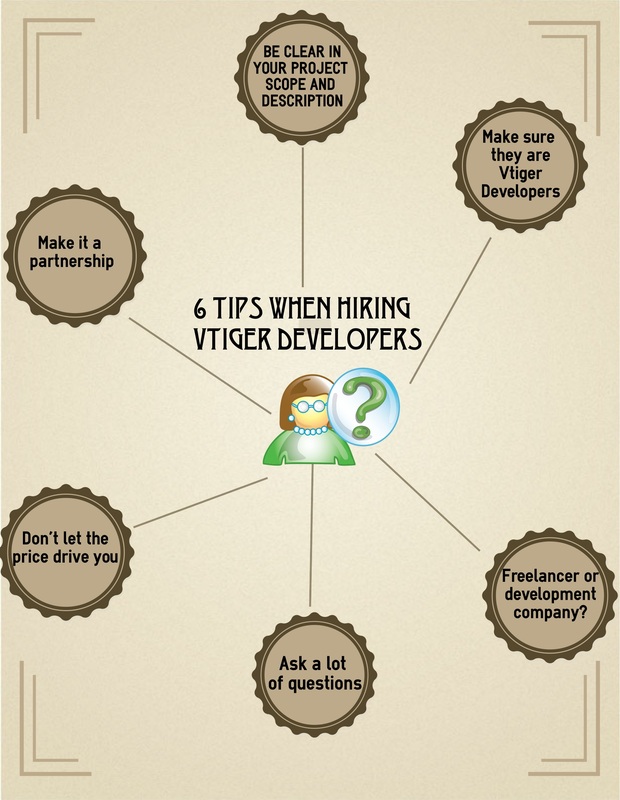 What is better for our organization, a Vtiger Development Company or a freelancer? The differences between the two may are significant, but the answer depends on your needs. Regarding pricing, freelancers are going to be less expensive overall, they may be the best option for small business and solo entrepreneurs if costs is the main factor. In terms of larger project, development companies are often better equipped to deal with a broader assortment of client needs, which may include long-term support (team members available at any time), ability to support larger technical requirements and so on. The way of communication will be different depending on freelancer or web design agency. A freelancer can be easily overwhelmed with projects meanwhile companies have processes in place to handle growth or scale. Nevertheless, it is important to understand the capabilities of specific agency or freelancer that you are speaking to. So, your search has been successful and you have set up meetings with a few Vtiger CRM developers companies, this is your chance to find out whether someone of these people are the right profile for your company. They know the industry very well, great engineers are extremely well informed of software effors that makes them more efficient with their time. They understand the goals of the business, or product-awareness. Great developers are aware of what the business is trying to achieve, they know what matters and what doesn´t. They get your business idea and they act part-time consultant, part-time developer. One important thing you should keep in mind, obviously, the technical skills of the developer team are important but so are soft skills, don´t forget that when assessing you candidates. Think the whole package, not just coding. We cannot stress this enough, do not select a developer based on a price quote. Go for the great product, not the cheapest one. 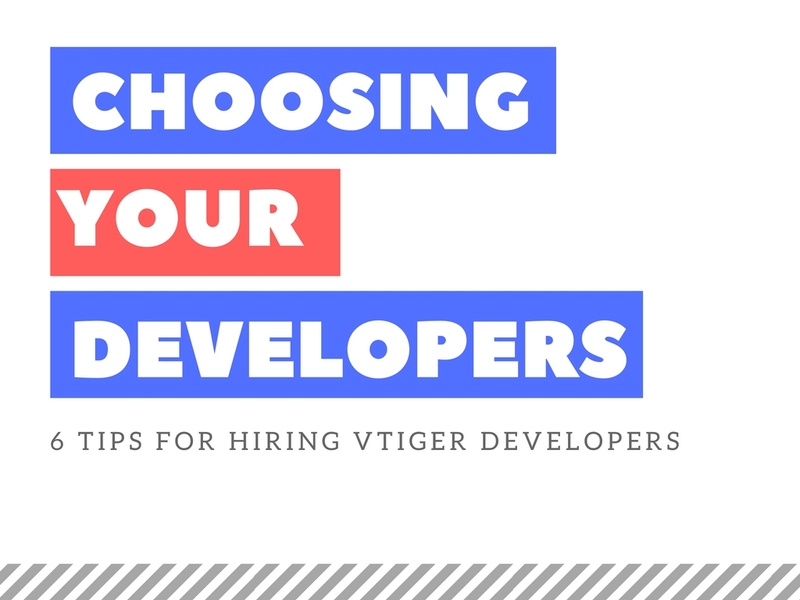 It is known that the lowest option often turns out to be more expensive in the long run, for example, if you have to hire a new developer because it didn´t work as planned with the first one. It is important to understand the fact that developers will be your partner in a business trade, exchanging value with you on equal footing – you provide the money and they provide their expertise and skills. Last but not least, don´t rush into a serious commitment like hiring a web development agency but you should keep your options in mind.